To any South African, there are no words more painful as these. Load shedding has once again become a reality and I fear many citizens may develop nyctophobia (the extreme fear of darkness) or the opposite of electrophobia (the fear of electricity). Being without electricity is extremely annoying but I have to admit that when the lights go out, nothing freaks me out more than going to the bathroom at the office or in a shopping center. No, I’m not worried that something is going to jump out and grab me but I am worried about hygiene standards while the lights are out. What about hygiene during load shedding freaks me out? Surely services don’t stop when the lights go out? Your mobile phone becomes your flashlight during power outages which means that the percentage of office workers that take their phone into the bathroom probably increase from a third to at least three quarters. All I see is the risk of cross contamination. If you missed the article read it here. People are probably not washing their hands properly as they are trying to minimise their time in the dark bathroom, which increases the risk of cross contamination. Click here to find out why it’s important to maintain hygiene compliance. or using toilet paper to dry their hands - you need a lot more toilet paper than hand paper to effectively dry your hands. Wondering how much money is being wasted on buying more toilet paper than usual? This isn’t ideal as you will probably not dry your hands properly and we all know that drying your hands properly is just as important as washing them. Have you thought about this? (I have a length) But now is NOT the time to wallow in concern, it’s time to be proactive! Ensure that you have an ‘emergency light’ in every bathroom cubicle and by the basin. You have the option of buying a battery powered light or a rechargeable light that ensures no one is left in the dark. If you have an electric hand dryer in your bathroom ensure you have a pack paper towel near the basin so that your colleagues and customers can dry their hands properly. 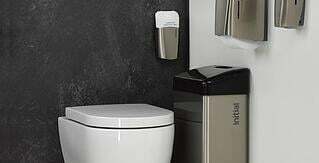 For more information on a paper towel option get in touch with Initial. Invest in hand sanitiser as people might not be washing their hands properly to escape the dark bathroom quicker. It’s advisable to reduce the risk of cross contamination by placing an additional hand sanitiser unit by the bathroom door in your workplace. Simple yet effective. All three of these options are quick to implement, cost effective and can be temporary if you don’t want items fixed to your bathroom walls. Remember that although Initial can’t help you with emergency lights, we can definitely help you with solutions for hand paper and hand sanitiser. For more helpful hygiene tips and articles, subscribe to our blog. Looking for some helpful ways to ensure the office bathrooms stay clean and hygienic? These helpful bathroom posters were designed to help remind people about bathroom hygiene and give you peace of mind.